GIS/Defense & Foreign Affairs, Roseau. U.S. national security officials were, on the night of Feb. 7, trying to determine whether an opening had arisen because of the sudden eruption of political unrest in Dominica to reverse the major diplomatic and intelligence gains of the past decade by the People’s Republic of China (PRC) in the Caribbean, the “third border” of the US. 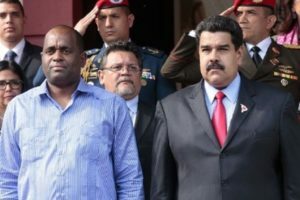 Venezuela’s leader Nicolás Maduro, right, with Dominica Prime Minister Roosevelt Skerrit in a 2015 photo. Sources in Roseau, the Dominican capital, as well as in Washington, DC, were questioning whether this would present the first “national security crisis” of the new U.S. Donald Trump Administration, and present a further chance for the U.S. to push back against PRC strategic expansion and also to curtail a global Iranian sanctions avoidance scheme centered on the Caribbean. Anti-Government protestors remained on the streets of Roseau, the capital of the Caribbean island Commonwealth of Dominica, late into the night of Feb. 7, but the peaceful protest rally against Prime Minister Roosevelt Skerrit earlier in the day had begun to unravel as the restraint of security forces began to evaporate. Gunshots were heard in the city of 20,000 inhabitants, and fires were burning. Earlier, and throughout the day, the thousands of protestors in the streets of Roseau had been contained by Dominican Police — there are no Armed Forces on the island — in full battle dress and weapons, with snipers on key rooftops, even though there are few, if any, firearms in private hands in Dominica. The Police riot suppression equipment was recently supplied by the PRC. The protests against the Skerrit Government had risen rapidly, following disclosure of a series of interrelated scandals which involved the sale of Dominican diplomatic passports to individuals involved with the intelligence services of the People’s Republic of China (PRC) and Iranian sanctions-avoidance operations. The PRC maintains the largest embassy on Dominica, after Prime Minister Skerrit had broken diplomatic relations with the Republic of China (ROC: Taiwan) in 2004, and opened relations with the PRC, without parliamentary discussion. Significantly, the PRC now has the biggest embassy in Dominica, substantially disproportionate to the size of the country (population 72,000). The U.S. does not maintain an embassy on the island, covering it from its Embassy in Barbados. Elements of the Skerrit Government had attempted to deny that Mr Skerrit was under investigation by U.S. law enforcement for violations of U.S. law and for violations of the U.S. Comprehensive Iran Sanctions, Accountability, and Divestment Act (CISADA) of 2010, and particularly in relation to money-laundering linked to CISADA, among other issues. Prime Minister Skerrit, whose wife is a U.S. and Dominican dual citizen, and whose children are U.S.-born and U.S. citizens, has an expensive apartment in New York City — valued in excess of his nominal asset value based on his earnings as a politician — and visits the U.S. regularly using his diplomatic passport. As a result, he was becoming increasingly exposed to prosecution in the U.S. and to legal cases lodged by Dominicans in the U.S. The main questions, as of late Feb. 7, centered around what the PRC or Iran could do to sustain their position involving Dominica, or whether the exposure of series of scandals and operations there made continued use of the base untenable for them. The use of the fleet of 11 Dominican-flagged oil tankers as a key component of the sanctions-busting operation would almost certainly no longer be viable, and pressures were expected to be placed on Greece — the center of the management of the vessels — to stop participating in the Iran sanctions avoidance scheme. The exposures began beyond the Caribbean on Jan. 1, with a US CBS 60 Minutes television exposé on the Skerrit Government’s sale of diplomatic passports to individuals engaged in illegal activities, but was further expanded by the Feb. 3, report by GIS/Defense & Foreign Affairs, and then by a detailed broadcast on the Dominica-linked strategic issues on the John Batchelor syndicated radio show on the U.S. Cumulus Radio network on the night of Feb. 6. Street protests in Dominica — which had begun on Feb. 2, in Roseau — then became significant on Feb. 7, and were mirrored by the Dominican community leaders who converged on Washington the same day. Significantly, Prime Minister Skerrit had not been visible in Dominica, and was reportedly still in Athens.